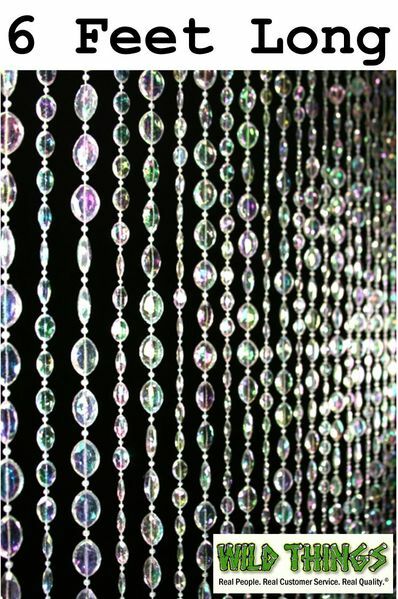 Our "Sparkles" beaded curtains have two sizes of chunky faceted beads in alternating strands made out of exquisite acrylic crystal. There are 23 strands per curtain. All strands are already hanging from one rod. Just take it out of the box, use 2 nails in the hooks, and it's up! 3 feet wide, 6 feet long. This curtain features stunning alternating strands of bead sizes. One strand has beads that are 1" long x 3/4" wide and the other strand has beads that are 3/4" long and 1/2" wide. The beads are a little more than 1/4" thick. We LOVE LOVE LOVE SUPER LOVE this new style! I love these and they look great. Prosjust as described, easy to install and beautiful!